Each variety has its advantages and disadvantages; it is a matter of choice and one’s financial budget. Open water hunting utilizes floating geese decoys that resemble natural or live geese roosting, resting, or feeding. The decoys are designed to create this quiet, natural, and peaceful scene. It encourages the flying geese to land. This decoy spread attracts smaller flocks of geese. These decoys are usually made of polyethylene plastic or soft rubber. They are artistically designed, painted, and positioned to resemble live geese feeding or eating off of the ground. They appear very realistic and effectively entice flocks of geese to land and claim the unoccupied territory of the feeding site as their own, to the hunter’s delight. One set made by Cabela is priced for less than $500 and is available through sporting goods stores, Internet marketing sites, and catalogue retailers. Floating geese decoys are placed in standing water areas such as in lakes, rivers, and ponds. They float on top of water and are designed to look like geese simply swimming or treading water in natural positions. They look real to both humans and geese that are motivated to land and join the resting flock of geese in the water. The hunter(s) are hidden in the camouflage blind awaiting their unsuspecting prey. It is critical to have a plan to retrieve the decoys. These decoys are also made of plastic polyethylene or rubber and cost less than $500 for a set of 24 floating decoys. Collapsible goose decoys are very light weight and are considered much easier to manage than other types of decoys, such as three-dimensional or full-bodied decoys. These decoys are full-blown plastic that rest on a plastic stake. They appear very natural to approaching geese; when the wind blows, they move. They can be very deceptive to geese who have excellent eyesight, but effective when the hunters are concealed in blinds, either sitting or lying down. 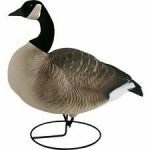 ·	Full-bodied geese can be used in a field or water decoy spread. It has one primary advantage, realism. The decoys even have feet. It is usually utilized in field decoy spreads. The decoys make it appear as if the geese are in motion; there are several different poses. The polyethylene is artistically designed to replicate a live goose, complete with molded feathers. There is limited movement; instead of being anchored on plastic stands, large black feet on metal stands anchor the geese. These decoys are not stackable and the price ranges from $120-$175 for a half dozen. The most popular manufacturers are Greenhead, Flambeau, and Big Foot. ·	Shells- the decoy is simply made to resemble the shell or outside of a goose; it does not have legs, but is anchored on metal stands. They are relatively inexpensive and are often used in conjunction with full-bodies decoys to complete or fill out a decoy spread. The spread is set up in volume to depict or resemble many geese feeding and has the capacity to be assembled quickly. The most popular manufacturers are Carrylite and Greenhead for these stackable decoys, although there are other quality manufactures. Prices range from $100-$175 for a dozen decoys. Silosock is one popular manufacturer of goose socks, which gives the illusion of motion to the decoy spread. The lightweight shell, without the belly, is designed to move in the wind. The body of the decoy fills when the wind blows and gives the appearance of moving geese feeding. These socks are often used in combination with other decoys to resemble a large flock of geese peacefully feeding in a field. Some are covered with cloth to prevent shine in bright sunlight, but because of the detailing are very deceptive to discriminating and wary geese. Typically hunters position three to four dozen goose socks. Hunters, to lure geese when they are making a final approach to a decoy spread wave these kite-like flags. They are designed to give the appearance of a goose’s wings flapping. This is a very effective technique that is utilized late in the season to attract geese that have successfully escaped the hunter’s bullets in the past, but have become very leery of populated feeding sites and are considered “gun shy.” Goose flags are rather inexpensive in comparison to other goose decoys.